If you have dry skin, you will know the importance of using a daily skincare regime: the use of specific beauty products and cosmetics that can help repair the skin's barrier to avoid discomforts such as tightness, itching or peeling. Let's discover how we can take care of dry skin in this post. How to know if my skin is very dry? Skin with little or no shine. A sensation of tightness minutes after washing the face. In the case of very dry skin, episodes such as itching or burning may also appear. If you have these types of skin sensations, especially after showering, you may have dry skin. These disadvantages are worse in winter because of the cold and the heaters that dry out the skin. But beware! 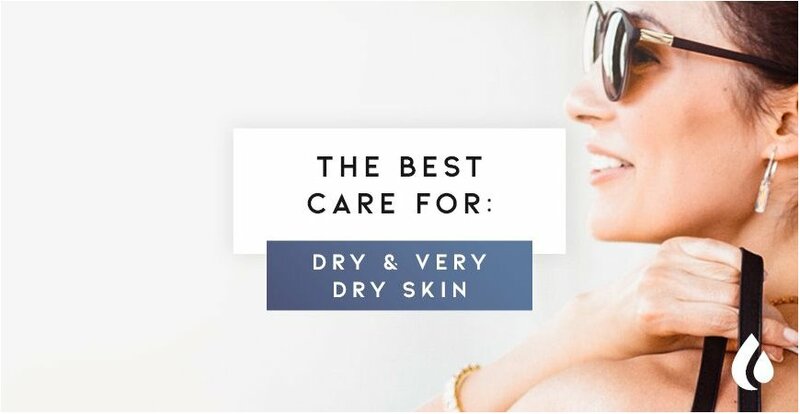 Do not confuse dry skin with dehydrated skin. Although the symptoms are similar, we must use different beauty treatments for each case. 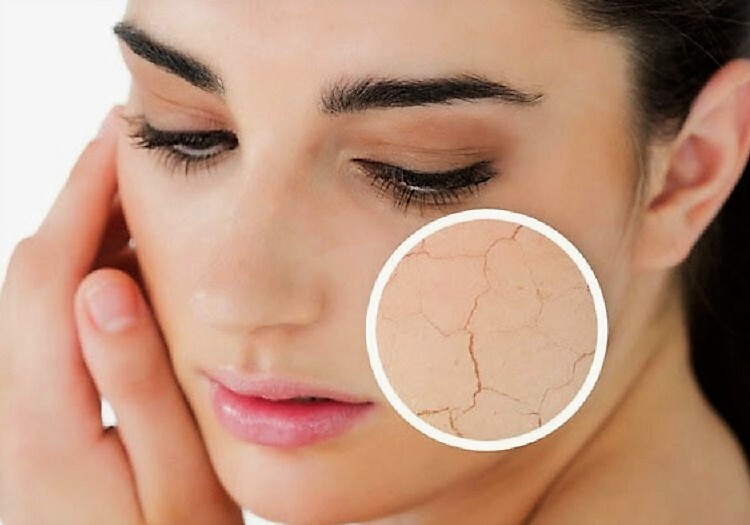 What are the causes of very dry skin? And what should we avoid? Our skin type comes in part already predefined since we were born by our genetics. In the case of dry skins, there is an insufficient amount of lipids produced which subsequently creates an imbalance in our skin. This lipid deficiency affects the barrier function of the skin, which means it is unable to work in optimal conditions and therefore unable to retain enough water. Being exposed to the sun in excess, especially when we don’t use sun protection. Extreme temperatures and abrupt changes: the changes of seasons, central heating, heaters, air conditioning can all dry our skin. Products with ingredients intended to regulate excess oils. Remember that dry skin already has a low level of naturally occurring oils. Abrasive exfoliants or granules are not particularly suitable for dry skin as they can cause excessive drying out due to scratching the skin's surface. Washing with cold water or showering with very hot water can weaken the protective barrier of the skin. The main goal for dry and very dry skin is to provide the oil and moisturizing ingredients that the skin lacks. Therefore it’s important that we choose a treatment that is specifically for dry skin. It’s recommended that both morning and night you clean your skin with cleansers and mild toners followed by correct hydration from a moisturizing cream. 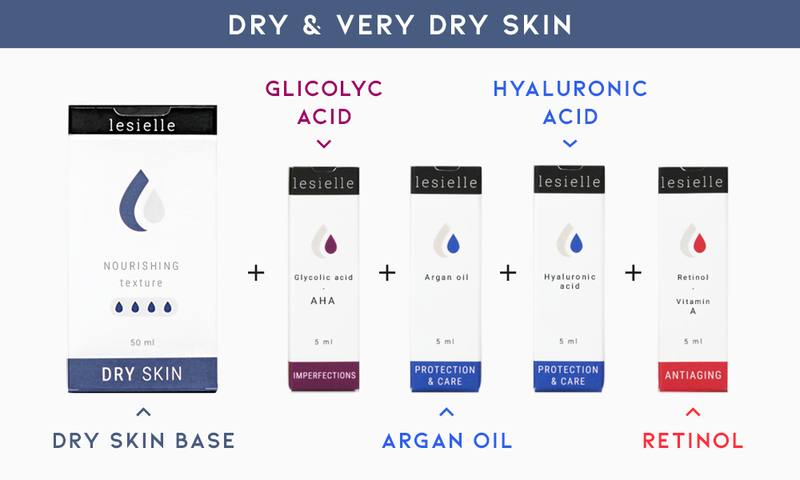 First of all, choose a Lesielle moisturizing base cream from the dry skin range. With this cream, we have already assured good hydration, and now, it’s just a question of adding specific active ingredients that we need according to our requirements and desired outcome. This is how easy it is to create your own personalized beauty cream treatment. Glycolic acid, the specific exfoliant for dry skin and will help us eliminate flaking skin and dead cells. In the case that we have acne, we can use Salicylic Acid instead. If you need an anti-aging treatment, don’t forget to include Vitamin B3, Peptides or Retinol! Learn about which one to choose! Do you have extremely dry skin? No problem: Hyaluronic Acid is your ally if you want a non-greasy hydration bonus. Do you want to pamper your skin more and have smoother feeling skin? Include Pure Argan Oil. Discover all the benefits at the #AdaptiveSkincare?